Global Colours is a world leader, famous for the quality and safety of their water-based products. 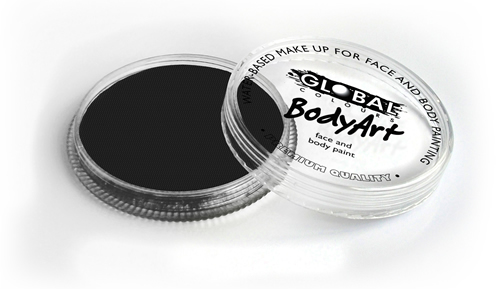 One of the most appreciated cosmetic lines offered by Global Colours is the BodyArt range, used by professional artists and on movie sets worldwide. The rich colours can enable you to create astonishing designs on the whole body. Containing 32 g, a perfect size for the busy, professional makeup artist. The most important attribute is that the range comprises a wide variety of colours that will meet the demands of all makeup artists. Your favorite design will be ready in no time! The Global Colours Makeup is activated with a small amount of water. Simply moisten your brush or sponge before applying the makeup. This will enable the colours to burst into life. The Global Colours products are water based, meaning that they are extremely easy to apply and remove. All you need is water and soap, and the makeup will wash away without needing to scrub. Chemical CAS Number, Water 732-18-5, Calcium Carbonate 471-34-1, Acacia Senegal Gum 900-01-5 ,Glycerin 56-81-5 Methyl Paraben 9-76-3 (newest batches are made without parabens according to the manufacturer and labels) May contain: Iron Oxides CI7491, Titanium Dioxide CI7891, FD&C Yelow 5 CI19140, FD&C Red 40 CI16035, FD&C Blue 1 CI42090, Ultramarines CI707, Mica CI7019. Manufactured with FDA approved pigments. Conforms to ASTM D4236, USP 61 Microbial limits tests, US California Prop 65 and CE-EN71 part 3: 194. All ingredients in this preparation are listed in the Australian Inventory of Chemical Substances (AICS). Global Colours’ range of products meet the standards set by US California Prop 65, ASTM D-4236 norms, FDA Regulations, European Regulations (CE-EN71 part 3:1994, EEC – 88/377 & 76/768), and has been tested for Metal Impurities and Hypoallergenic Properties by independent Australian laboratories. All Global products are GMO free and BSE Free according to statements issued by suppliers. Click here for a material safety data sheet for Global Colours. Global Colours puts a great empahsis on the quality and safety of their products. Global Colours makeup is specifically formulated to contain only approved cosmetic ingredients that are gentle on the skin. All products are manufactured under the strictest safety guidelines, and are compliant with EU and FDA Toy and Cosmetics principles. All makeup products by Global Colours is specially designed to be gentle, even to the most delicate types of skin, and they are fragrance free. Really easy to activate as the cake is already slightly soft. This product goes on easily, and didn't crack or flake off whist wearing it. Thankyou very much im looking forward to trying this later!